MANILA, Philippines – The November 2017 Nursing NLE board exam results including the full list of passers, top 10 examinees, top performing schools, performance summary of schools, among other related announcements are available at this website as PRC releases the results online eleven (11) working days after the last day of board examination. As announced, 5,875 out of 12,869 examinees successfully passed the exams. 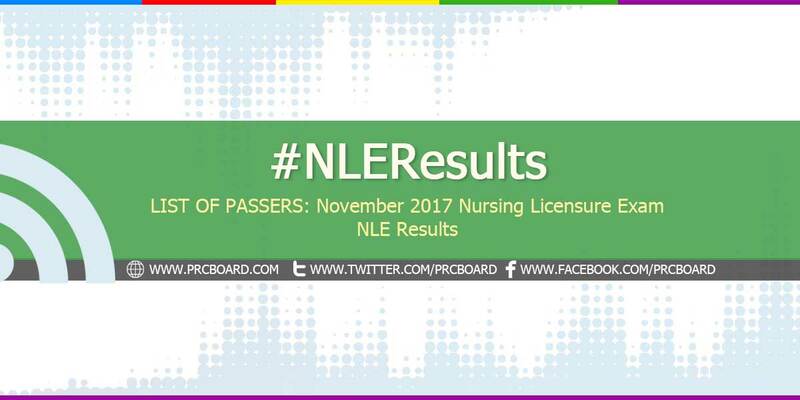 The Nursing Licensure Exams (NLE) are administered by PRC Board of Nursing (BoN) headed by its Chairman, Glenda S. Arquiza, and its members, Carmelita C. Divinagracia, Gloria B. Arcos, Carfredda P. Dumlao, Florence C. Cawaon and Cora A. Añonuevo on November 25-26, 2017 at PRC testing centers in Manila, Baguio, Cagayan de Oro, Cebu, Davao, Iloilo, Legazpi, Lucena, Pagadian, Tacloban, Tuguegarao and Zamboanga. According to the Commission’s Resolution No. 2016-1019 series of 2016 entitled “Schedule of Licensure Examination for Year 2017”, the target release date of November 2017 Nursing board exam result will be in fifteen (15) working days after the last day of board examinations or by December 15, 2017 (Friday). However, results may also be released earlier or later without prior notice. On the same exams conducted by PRC on June 2017, results were out after eight (8) working days, on November 2016, results were released after twelve (12) working days. On June 2016, results were out after nine (9) working days while twenty-four (24) working days during November 2015. The schedule of online appointment for issuance of Professional ID and Certificate of Registration will start be from January 3 to January 9, 2018. During November 2016 NLE, 6,836 out of 14,322 examinees passed. University of Santo Tomas and Benguet State University - La Trinidad shared the top spot in the top performing schools' list having all of its examinees passed or 100.00% overall passing rate. Eric Carolino Jacinto from Saint Louis University and Faith Calzado Rutagines from University of Santo Tomas ranked first in the exams garnering 86.60% rating. They were followed by Benedict Mark Magat Bunal from University of the Philippines (UP) - Manila and Augustine Beth Dionisio Cortez from University of Santo Tomas (UST) having 86.20%. On June 2016 Nursing board exam, 6,183 out of 14,184 examinees passed. West Visayas State University - La Paz ranked first in the list of top performing schools having 96 out of 96 examinees passed or and equivalent 100% overall passing rate. WVSU was followed by Bicol University Legazpi having 73 out of 82 examinees passed or 89.02% passing rate. Bernard John Ezra IV Rafols Icamen from Cebu Normal University (Cebu State College) and Melissa Castor Malong from De La Salle University - Health Sciences Institute topped the exams garnering 87.20% rating. To receive up-to-date news on full results of November 2017 Nursing NLE board exams, we advise our visitors to bookmark this page, visit PRC official website or follow us at our social media pages via Facebook and Twitter. Good luck Nurses! Keep the faith! kelan daw ba lalabas ?